“It’s the best versus the best,” Harris proclaimed. Brown got the best of Harris last time. The star cornerback hadn’t surrendered a touchdown in 35 games before Brown scored twice on him in man coverage in the Steelers’ 34-27 comeback in Pittsburgh on Dec. 20, 2015. “I hope we see them again,” Harris said afterward, and the feeling was certainly mutual — Brown caught 16 passes for 189 yards that night. It appeared Harris would get his wish a month later when the Steelers visited Denver for an AFC divisional playoff game. Brown didn’t get to play, however, after taking a vicious hit to the head from Bengals linebacker Vontaze Burfict the week before, a foul that set up Pittsburgh’s game-winning field goal in a wild-card game at Cincinnati. Harris was dealing with a bruised left rotator cuff that basically turned him into a one-armed tackler, but he helped the Broncos beat the Brown-less Steelers 23-16, propelling them on their Super Bowl title run. 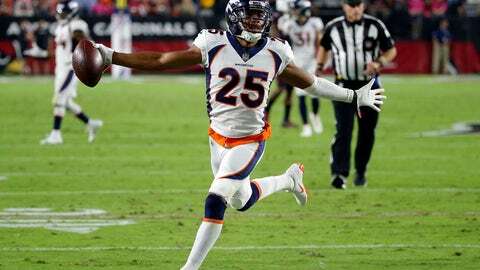 Although Denver (4-6) hasn’t been back to the playoffs since, Harris remains one of the game’s great shutdown cornerbacks. His interception of Philip Rivers last week made him the only player in the NFL with multiple interceptions each of the past seven seasons. Brown is just as good as ever, too, helping the Steelers (7-2-1) stay atop the AFC North year after year. His 11 TD catches this season are tied with Kansas City’s Tyreek Hill for the league lead. Of his 130 games, including the playoffs, Harris has never had a worse game than he did the previous time he faced Brown. Harris faces No. 1 receivers week in and week out, but Brown is special. He’s one of just four active players with 40 100-yard receiving games (Julio Jones, Brandon Marshall and Larry Fitzgerald are the others). “He has great route-running and they let him play,” Harris said, suggesting officials let him get away with separation tactics. “They let him play a little bit at the top of the routes. Also what he does, Big Ben (Roethlisberger) extends a lot of time for him and then he can kind of free-lance and get deep. Harris often voices frustration about not getting a lot of action on his side of the field, but he eagerly anticipated last week’s game against the Chargers because he knew Rivers would challenge him. Harris also knows that Roethlisberger won’t ignore him Sunday . There are signs Harris won’t have another patchwork secondary surrounding him like the previous time. Cornerback Bradley Roby, who left the previous game with a concussion, is progressing and the Broncos are hopeful he’ll be back in the starting lineup this weekend.